About this appendix: While heavier forms of straw-clay construction have been used in various parts of the world for thousands of years, light forms of straw-clay construction began to appear in Europe in 1950 and in the United States in 1990. These lighter forms of straw-clay construction are intended as infill materials in nonload-bearing walls. The advantages of light straw-clay construction, such as regulated by Appendix R, include thermal performance and low environmental impact. This appendix shall govern the use of light straw-clay as a nonbearing building material and wall infill system in Seismic Design Categories A and B. Use of light straw-clay in Seismic Design Categories C, D0, D1 and D2 shall require an approved engineered design by a registered design professional in accordance with Section R301.1.3. The following words and terms shall, for the purposes of this appendix, have the meanings shown herein. Refer to Chapter 2 for general definitions. CLAY SLIP. A suspension of clay subsoil in water. CLAY SUBSOIL. Subsoil sourced directly from the earth or refined, containing clay and free from organic matter. INFILL. Light straw-clay that is placed between the structural and nonstructural members of a building. LIGHT STRAW-CLAY. A mixture of straw and clay slip compacted and dried to form insulation and plaster substrate between or around structural and nonstructural members in a wall. VOID. Any space in a light straw-clay wall wider than 1/4 inch (6 mm), greater than 2 inches (51 mm) in horizontal length and greater than 2 inches (51 mm) in depth. 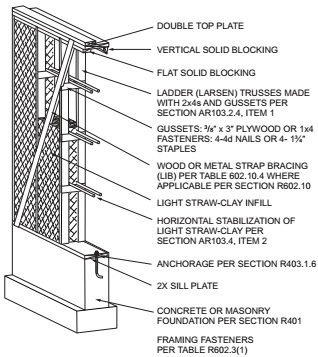 Bracing for buildings with light straw-clay infill shall be in accordance with Section R602.10. Walls with light straw-clay infill shall use Method LIB and shall not be sheathed with solid sheathing. Walls without light straw-clay infill shall comply with any bracing method prescribed by this code. AR103.2.3Requirements and properties of light straw-clay mixtures. The requirements and properties of light straw-clay mixtures shall be in accordance with Table AR103.2.3. ©Douglas Piltingsrud and StrawClay.org. Used by permission. a.Interpolation permitted. Extrapolation not permitted. b.Water mixed with subsoil equals clay slip. A.Lab test for percent of clay, silt and sand via hydrometer method. B.Ribbon Test or the Figure 3 Ball Test in the Appendix of ASTM E2392/E2392M. d.Trace amounts of organic materials are acceptable. 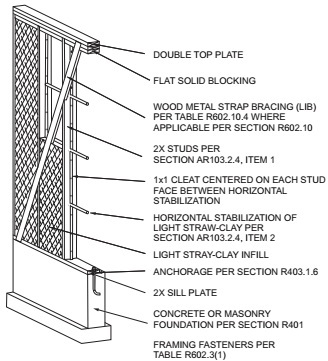 1.Vertical stabilization shall be of structural or nonstructural wood framing in accordance with Figure AR103.2.4(1), AR103.2.4(2) or AR103.2.4(3). 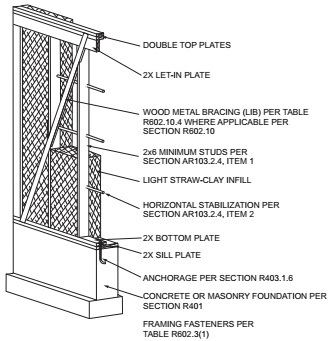 Framing members that are both load-bearing and stabilization members shall meet the requirements of Section R602 and this section. Nonstructural stabilization members shall be not more than 32 inches (813 mm) on center. 2.Horizontal stabilization shall be installed at not more than 24 inches (610 mm) on center and in accordance with Figure AR103.2.4(1), AR103.2.4(2) or AR103.2.4(3). Horizontal stabilization shall be of any of the following with the stated minimum dimensions: 3/4-inch (19.1 mm) bamboo, 1/2-inch (12.7 mm) fiberglass rod, 1-inch (25 mm) wood dowel or nominal 1-inch by 2-inch (25 mm by 51 mm) wood. The materials used in light straw-clay construction shall be in accordance with Sections AR103.3.1 through AR103.3.3. Straw shall be stems of wheat, rye, oats, rice or barley, and shall be free of visible decay, insects and green plant material. Suitability of clay subsoil shall be determined in accordance with Table AR103.2.3. A light straw-clay mixture shall consist of loose straw mixed and coated with clay slip such that there is not more than 5 percent uncoated straw, and shall be in accordance with Table AR103.2.3. The maximum thickness of light straw-clay shall be in accordance with Table AR103.2.3. AR103.4.5Contact with nonwood structural members. 1.Formwork shall be sufficiently strong to resist bowing where the light straw-clay is compacted into the forms. 2.Light straw-clay shall be uniformly placed into forms and evenly tamped to achieve stable walls free of voids. Light straw-clay shall be placed in lifts of not more than 6 inches (152 mm) and shall be thoroughly tamped before additional material is added. 3.Temporary formwork shall be removed from walls within 24 hours after tamping, and walls shall remain exposed until moisture content is in accordance with Section AR103.5.1. Visible voids shall be filled with light straw-clay or other insulative material prior to plastering. 1.Rough framing for doors and windows shall be fastened to structural members in accordance with the International Residential Code. Windows and doors shall be flashed in accordance with the International Residential Code. 2.An approved moisture barrier shall be installed at window sills in light straw-clay walls prior to installation of windows. AR103.5.1Dimensional stability of light straw-clay prior to application of plaster finish. Light straw-clay infill having a density of 30 pounds per cubic foot (480.6 kg/m3) or greater shall be dry to a moisture content of not more than 20 percent at a depth of 4 inches (102 mm), as measured from each side of the wall. Light straw-clay infill having a density of less than 30 pounds per cubic foot (480.6 kg/m3) shall be sufficiently dry such that the overall shrinkage of the light straw-clay is dimensionally stable. Exterior plaster shall be clay plasters or lime plasters. Interior plasters shall be clay plasters, lime plasters or gypsum plasters. Plasters shall be permitted to be applied directly to the surface of the light straw-clay walls without reinforcement, except that the juncture of dissimilar substrates shall be in accordance with Section AR103.5.4. Plasters shall have a thickness of not less than 1/2 inch (12.7 mm) and not more than 1 inch (25 mm) and shall be installed in not less than two coats. Rain-exposed clay plasters shall be finished with a lime-based or silicate-mineral coating. AR103.5.3Separation of wood and plaster. Exterior cladding shall be spaced not less than 1/2 inch (19.1 mm) from the light straw-clay such that a ventilation space is created to allow for moisture diffusion. Furring strips that create this ventilation space shall be securely fastened to the stabilization members or framing. The cladding shall be fastened to the wood furring strips in accordance with the manufacturer’s instructions. Insect screening shall be provided at the top and bottom of the ventilation space. Walls with light straw-clay infill of densities of greater than or equal to 20 pounds per cubic foot (480.6 kg/m3) shall be classified as mass walls in accordance with Section N1102.2.5 (R402.2.5) and shall meet the R-value requirements for mass walls in Table N1102.1.2 (R402.1.2). Walls with light straw-clay infill of densities less than 20 pounds per cubic foot (480.6 kg/m3) shall meet the R-value requirements for wood frame walls in Table N1102.1.2 (R402.1.2). Light straw-clay shall be deemed to have a thermal resistance as specified in Table AR103.2.3.